I pity the Fool! Oops, not this fool. The name shouldn’t confuse you. This is a wickedly easy and yummy desert. When I say fool, I am not referring to the misguided, yet sweet person standing at the grill in 100 degree heat. No, I am referring to the English desert made of fruit and cream. This recipe comes with a twist. Why not grill your fruit instead of heating up your kitchen by cooking it on the stove. Besides, grilling imparts a warm smokey taste to the fruit. Not to mention a wonderful caramel color. So if the grill is still warm from dinner, grill some fruit to make this recipe. Heat the grill to medium. Spray a grill basket with cooking spray. Grill the peaches and strawberries until tender and starting to brown. Remove the strawberries after 5 minutes. Flip the peaches and grill a bit longer about 5 minutes. Set aside and allow the fruit to cool until it is easily handled. Take the skins off the peaches. Cut the fruit into chunks and put in a large bowl. Mix in the honey and lime juice. Set aside and allow to cool completely. With a mixer fitted with a beater, beat the cream, powdered sugar and vanilla until soft peaks form. 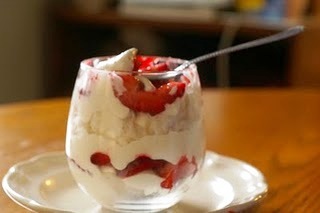 Arrange the fruit and whip cream in layers. Haha I like the first photo! These look delicious though and pretty easy to make! Thanks for sharing! A perfect ending to a hot day! 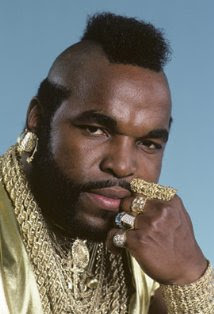 OMG I totally forgot about Mr. T! And this recipe sounds super yummy!! Looks wonderful! Love the idea of grilling the fruit to put in this, great post! This is perfect for summer. Did you put some angel food cake in there too. Oh, what a good combo.!! PERFECT! Since I’m the fool in front of the grill….this was made for me! I was wondering what Mr. T was doing on your blog…too funny! 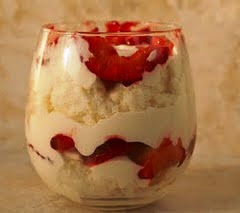 But your peach strawberry fool is no joke…wow, it looks amazing! All of these sound so good! What a perfect summer treat! I love grilled fruit! Have you ever tried this with a balsamic reduction too? That one my my favorite things to do with strawberries or cherries. I’d be a grilling fool for that lovely dessert. What a beautiful dessert. I’m going to give this a go. Thanks for the recipe. That’s the perfect dessert for whenever I’m craving something, but can’t do anything too complicated! Hi Veronica.. wanted to stop by and say hello. I’m also a newbie at CMO. You made me laugh with that pic of Mr T.. I recently introduced my children to the charms of A-Team. I also love cooking and baking.. I know I’ll be back. Hop over to my blog when you get time. I love using grilled fruit in this dish! So perfect for a summer time dessert! Wow! Grilling the fruit is unusual. Lovely dessert. What a great summer dessert. And, I love the retro pop culture reference! Great post:)) Love Mr.T:)) I also love grilled anything and this looks very very delicious! Cool post, love the intro with Mr. T. Grilling the fruit for this dessert was a great idea. The picture is making me hungry-yum! Very clever. I had to laugh! That looks really good, and I really like the grilled fruit in it. I’m visiting my daughter in England next month. I’ll have to ask her husband about that one. Creative and cheeky post. Well done.